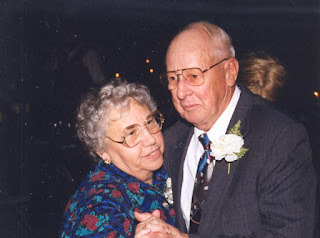 I know how very fortunate I am that I have had my grandfather and my grandmother in my life for 45 years. My girls are all fortunate to have know them both as well. This knowledge, however does not make it any less painful to watch him go. My grandpa has always been a do-it-yourself kind of guy. I recall many weekends of my childhood watching and helping as the family put shingles on a roof, poured a concrete pad for a patio, built a garage, put up a shed or any other thing that needed doing. Those were the big jobs, things for which Grandpa, Dad and a variety of aunts, uncles and cousins would all come together--many hands making light work. There were smaller projects too, things that could be done alone or with the help of one or two others: fixing a leaky pipe, laying linoleum, changing the oil in the car, or greasing up the tractor. Grandpa could do anything! He taught us too, made us “Go-fors” and holders, and runners; little apprentices. When we were really small, he’d let us sit on his lap and “drive” the tractor. As we got older, we really did learn a lot and actually helped with some of the work. Sometimes I like to think I can actually do all those things we used to help with. The reality is, I usually end up needing help and calling Grandpa or my brothe,r Brian. The garden is more our shared domain now--has been for a number of years. Grandma and Grandpa have always had a magnificent plot. Nearly perfect rows of carrots, beans, lettuce, corn, butternut squash, zucchini, yellow squash, peppers, onions, beets, and of course tomatoes, lots of tomatoes, sprouted from the large brown rectangle of tilled earth. I remember their garden over on Humphrey Road. They lived there from before I was born until I was ten. We’d spin in circles, one arm stretched out holding on to a pole--the ones that held the roof over the patio. We’d play badminton over the clothesline. We’d ride Grandpa’s bike to the right down to Cam’s big green barn and back the other direction, past Uncle Donny’s to Great Grandpa’s and return. On cold or rainy days we’d stay inside and play in the basement. The most immaculate basement I’ve ever seen. I felt a jolt of pride when, just last summer, Grandpa let me rototill his garden for him. The stroke had taken its toll and he just wasn't able to walk behind that big machine anymore. Of course, in true Grandpa fashion, he critiqued my work and told me what I should do different next time. Last Sunday when I went to see him at Hospice, we talked about the garden: what should we plant? When should we start? Will it be a good year for the corn? Grandma stood off to the side and shook her head. She has no intention of doing all that work on her own again this year. It made him happy though, to think of all that delicious food, the feeling of a hard day’s work in the clean fresh country air, and I have to believe, the legacy he helped foster. It seems a good time to share some of the dear memories that scroll through my personal viewfinder when I close my eyes and think of Grandpa. This one time, I was young, probably seven or eight years old, we made milkshakes in these plastic mugs. Grandpa scooped up ice cream, poured in milk, then added a little sugar and some vanilla. The thing was, he handed me a spoon and we had to mix them by hand--not in a blender like my dad had always done at home. I can picture Grandma in the kitchen, and the big yellow Corningware bowl on the counter--she must have been making bread or cookies. The image is fuzzy. I can almost smell that distinct scent of Grandma’s and Grandpa’s house, but the smile on his face as we stirred and stirred those milkshakes is clear as day. We used to go to Friday night services at Bethel Church in Tonawanda. Grandpa always sat on the right end of the pew, on the right hand side of the church. Us grandkids would sit between him and Grandma. Inevitably, about half way through the sermon, Grandpa’s head would slump over or tip straight back as he dozed off. Occasionally he’d even let out a little snore before snapping back up to attention a bit embarrassed that he might have been caught napping. Another time, more recently, I had taken my girls over to offer to help out with a few chores. Grandpa was out back with a gallon of paint, trying to put a seal on the concrete at the base of the house. Strong willed as he has always been, he was trying to hold himself up on his walker, stretching his other hand down toward the ground trying to paint. I talked him into letting us help--no easy feat mind you. Taking a step back, I have a beautiful image of him talking and pointing, coaching Josephine on how he wanted the painting done. I wish I recall the circumstances, but at some point when Miss Barb babysat the girls, Corliss must have gone with her to visit my grandparents, or they may have stopped at her house. Either way, I remember the broad smile and gleam in Grandpa’s eyes as he told me of CC singing and dancing for him. For several years, every time he saw Corliss, he’d ask her to sing and dance for him--always with a smile full of pride and love. Patience and IdaLena love to tell about the time we went over to help in the garden. It had gotten hot and everyone was getting a bit cranky. Grandpa suggested that Gram get some ice cream out. So, grandma got out a box of cones, and scooped up some vanilla for each of the girls. She rinsed off the scoop and put the bucket of ice cream immediately back into the freezer. Grandpa turned in his chair to see the girls all lapping up the cool treat and frowned. “Ma,” he said slowly, “I think you forgot someone.” She looked at me a bit confused for just a second before realizing that HE wanted some too. We all get a chuckle out of that from time to time. It warms my heart that my girls have all gotten at least a few of his lessons to carry with them as they grow. About 4 years ago, after the car wreck but before the stroke, I stopped out for my usual Tuesday afternoon visit. As I pulled into the driveway I noticed he was up to something. That stubborn fool had was perched atop his stepladder, which he had set up on the front porch, hammering away at a giant icicle that had formed where the two peaks met above the door. I got out of my truck and demanded that he get down and let me do it. You can imagine how well that worked. Perhaps my favorite nugget is Grandpa sitting at the head of the table after a holiday meal. It was most likely Christmas, but most of the details have faded. Sitting back in his chair Grandpa put his hands on the sides of his button up shirt stretched but not quite tight over his little pot-belly. As if picking up a watermelon, he gave it a little jiggle and belched--nothing loud or offensive, just a little belch. But then a devilish little grin spread across his face as he announced “I had to make room for pie”. Man did Grandpa love his pie! 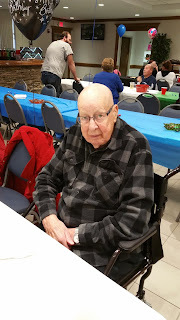 He truly enjoyed his desserts, strawberry shortcake, cookies, ice cream, and cake, but he loved his pie! I have snippets in my mind as well. Images more than full blown memories. Grandpa standing with a hat on, green work pants and knee pads--hard black plastic with padding underneath. He must have been kneeling to smooth out wet concrete. He had these metal rings that he used to wear when riding his bike. He’d fold over his pant leg at the ankle and slide it on top, (think pegged pants if you are old/young enough to remember the 1980’s), to keep his pant leg out of the chain. I can see him standing with a kitchen knife in one hand, a stone slab in the other. I can hear the sound, indescribable, yet unforgettable, watching him quickly, skillfully sliding the blade, one side then the other, back and forth across the stone until it met his satisfaction. Fish-Fry at Poor Man’s Castle. Standing in the backyard of his home in Florida, I watch him reach up to pick an orange off a small tree and smell it. Years later, his strong hand reaching into a 5-gallon bucket of grey and green pellets of fertilizer, sprinkling it gingerly around a young tomato plant. I have flashes too of every garage and shed he ever had. Everything was always put in its place. He’s used pegboards, cupboards, commercial tool chests, old style metal and wood toolboxes, and shelves. The key was every tool had a spot and when he was done with it, he or Grandma would put it back. He always had unique little storage spots too. A hook between the studs to hold table legs so they didn’t fall. A string tied to small nails to keep the handles of shovels, brooms and hoes from swinging out. He even had little cupboards--painted a blue grey, built into the stairs and the wall between studs complete with little wing nut latches. I have often suggested that he should come teach Craig how to organize his tools. I wish now, that I had followed through with the request, only half in jest, that he come supervise--just tell me where and how to put things in the garage and basement, I would have done all the work (if he had let me). The last few years have been hard on him. This strong independent man accustomed to doing thing for himself, when, where and how he wanted, found himself relying more and more on his wife and daughter. He bounced back from a car crash, only to have a stroke less than a year later. He has battled pneumonia nearly every winter since. Despite his frustration with his uncooperative body, he persevered. He managed to get back on his tracker to mow his own lawn. He would insist on going out to the garage or shed to fix this or that, or tinker around. Just this past fall, at 93 years old, he was outside on the ground helping me take the mower deck off of his tractor so it could be cleaned and put up for the winter. Frederick Walter Giertz is a man of strong faith, steadfast in his convictions. He has been married to Ida May (Heschke) aka Ike and Ma (more on that remarkable woman another time) for 68 years. He is a father, a grandfather, a great grandfather, a brother, and a friend to many. He is a good man who has lived a good life. Grandpa has been at Niagara Hospice House for a full week now. It has been hard to watch him go, but I know that he will be remembered with love and admiration.